Learn English in Brighton at our partner school, Embassy English. Embassy English opened a state-of-the-art English study centre a few years ago, setting new standards of excellence for teaching, social and residential facilities. 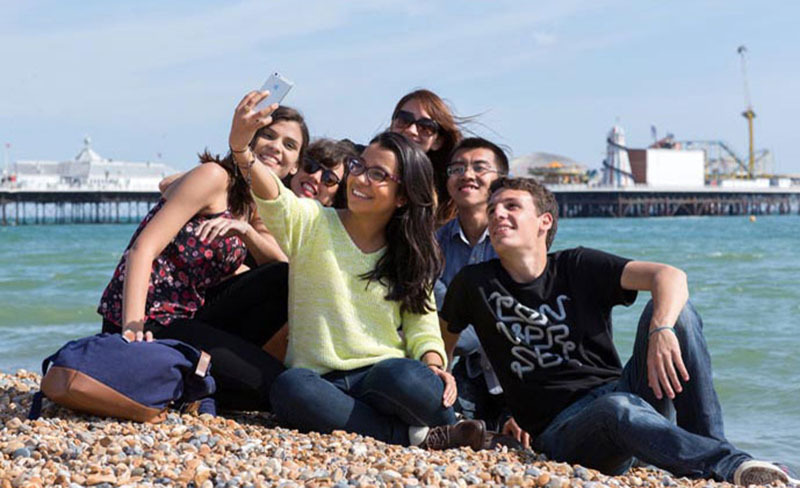 In simple terms, Embassy English Brighton is the best new facility for international students in Britain. The academic year course is a comprehensive language programme which will help you achieve internationally recognised exam qualifications. During an academic year abroad, focused language teaching and academic subjects will fast-track your learning. You'll gain fluency, achieve valuable qualifications and can opt to progress to a university degree course. 20 lessons per week. You can also choose to do 28 lessons per week. The extra 8 lessons are electives, for example business English, grammar or vocabulary. The price stated here is for an airport transfer on arrival at London Gatwick. Please fill out on the booking form where you will arrive. In 2019 the school is closed on: 01/01/2019-04/01/2019, 19/04/2019, 22/04/2019, 06/05/2019, 27/05/2019, 26/08/2019 and from 23/12/2019 to 03/01/2020. Missed lessons due to bank holidays will not be refunded or rescheduled. Please note: students aged 16-17 years must book half-board, a return transfer, and provide a guardian's consent form. The combined course combines 20 group lessons per week with 5 private lessons per week. This way you can enjoy the learning experience within a group while focusing on your specific needs during the private sessions. IELTS is the most commonly requested proof of level of English to study at universities in the UK, Australia, New Zealand and Canada. With ther IELTS preparation course you can prepare specifically for this exam. This course consists of either 20 lessons exam preparation per week OR 20 lessons exam preparation per week + 8 lessons general English, where you will work on essential skills such as grammar, vocabulary, reading, writing and communication skills. This course has a minimum duration of 2 weeks and requires a minimum level of intermediate. The IELTS course has a minimum duration of 2 weeks. During your stay in Brighton you can choose to stay in the on-site school residence "Voyager House" with half or full board. The residence is a modern purpose-built student accommodation located right beside a mainline rail station and in the heart of the city. With 370 single en suite rooms spread over 5 floors, it is an ideal place to stay while studying in Embassy Brighton. The accommodation features a large cafeteria and student lounges with foosball tables, TV’s and a piano. There is one main student common room located next to the cafeteria, with plenty of sofas and a large plasma TV with DVD player. The internet café is right next door to the common room, equipped with 50 PCs. From the residence it's a 20 minutes walk to the shops and 25 minutes to the sea front. Each of the bedrooms includes wireless internet connection. Bed linen and towels are provided and laundered. The cafeteria offers breakfast, lunch and diner with a wide range of choices. 16 and 17 year old students must book half or full-board options. During the week, lunch will either be at the school canteen or in the form of a lunch on voucher that may be exchanged at food outlets. If the half-board plan is booked, we need to be informed in advance of arrangements for under 18s to have lunch. The Voyager House accommodation can not be booked with a shared room. The Britannia Study Hotel offers stylish, state of the art student living with large modern single bedrooms in a hotel environment. All rooms are en suite with wood flooring and a double bed,s. The common facilities include free wireless internet, fully equipped kitchens on every floor and lounges with sofas, flat screen TV’s, coin laundry facilities and a private café for students.